Teething is an important event in the lives of both parents and babies. It can be a little frightening and uncomfortable for the baby but it truly presents a new page in the baby’s life and a rite of passage of sorts. Teething means that the baby’s teeth are starting to sprout and rise through the gums. Parents are often worried and wonder how to recognize the first sign of teething in their baby so they can provide relief and comfort through the process. Teething varies from child to child, but there are some key points that are common for all babies. This process usually starts around three months of age, although it is not rare for some babies to start teething at six months or even one year. Ordinarily, the process has its peak around one year of age and ends at two years. Some babies are even born with a tooth or two. When a baby starts teething, there are usually some signs that can help the parents understand that the process has begun and that there is nothing wrong with the baby. Those signs can be irritation, snappishness, fatigue, lack of appetite and waking up during the night. 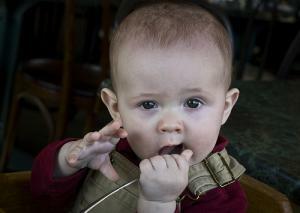 Sometimes babies put their hands to the mouth or even touch the gums. This is normal and it may be helpful to purchase a teething ring or a similar item the baby could chew on. Those rings have little tots that gently massage and soothe the gums that feel tender and swollen. Babies also tend to gnaw on hard objects to relieve the discomfort due to teething. They should not be stopped if doing that, and the parents should provide clean and baby-friendly toys and objects and offer them to the baby. During teething, the production of saliva increases so the baby may get a bit slobbery. The great amount of saliva can cause the baby to make a cough-like sounds and motions. This too is nothing to be worried about. The contact with the mother is very important in the teething period. A mother’s touch, swaying, hugging and snuggling will comfort the baby that is likely to be a little irritable. Around this point in baby’s development and growth, parents usually start to introduce solid foods. This should be done carefully, cutting the food in small bite-size portions and monitoring the baby during eating. There are some useful products that grind the baby’s food in case he or she is still too young to actually chew or if all the teeth have not surfaced yet. One thing parents should look out for is the possibility of an ear infection once the rear teeth start to grow. This happens because the excess saliva sometimes gets stuck in the nasal passages and gets contaminated, creating a possibility for an ear infection. This is why it might be a good idea for parents to buy a horoscope, which they can use to monitor the state of baby’s ears. Ear infections are not dangerous but it is certainly better to prevent them and spare the baby of unnecessary pain. Rough Area Under The Tongue? Braces vs retainers to fix my canine teeth going high in the gums? Is it truth that the later the teeth come through the better they will be?